Prioritizing sequentially can be difficult and time consuming. If your team are using Kanban or very short iterations, the priority is less and less interesting for each otems corresponding with the time between now and implementaiton. If the item are set to be done in the vast future the priority will probably change before we arrive to that future anyway – what is important is the priority of iems closest in time. To help us make a pragmatic but valuable priority we can use a system often referred to as the Berlic pyramid. 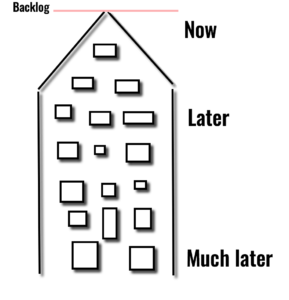 The purpose of the pyramid is to force the product owner (or the corresponding role) to prioritize (hard), without requiring a sequential priority on the entire project’s backlog. This is easy to visualize by using the Berlic Pyramid. The closer in time until implementation, the higher we put it in the pyramid. This make sit easy to see that only a few items may have the same priority. Further down the pyramid several items can have the same priority. At the bottom it does not matter at all anymore since those items are things to be done “sometime” in the future. The size of the pyramid varies depending on the size and lead time of the team. If you have a big team you might fit more than one item at the top but I would never recommend more than two or three items. If you put three, then one should still have the highest priority over the two others. Small team – one item. Big team – three items (top). Remember that the Berlic Pyramid is a great tool to show product owners (and the team) that resources are always limited. Are you using Berlics Pyramid-principle to prioritise work? Tell us about your hardest struggle or biggest win with this method in the comment section below. How many items do you usually put on top?